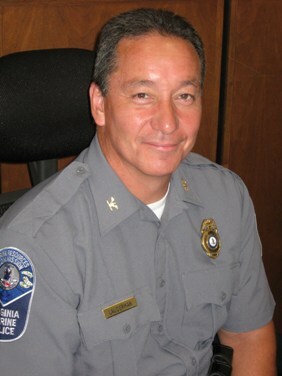 Rick has been chief of the Virginia Marine Police, the Law Enforcement Division of the Virginia Marine Resources Commission, since August 2006. He is responsible for managing the state's 80-member Virginia Marine Police, which is one of the state's oldest law enforcement agencies. Marine Police Officers are stationed throughout the Chesapeake Bay, and many are deputized federal law enforcement agents. As Chief, Rick's responsibilities include Homeland Security for vital facilities in the Hampton Roads region, as well as administering a joint enforcement agreement with the federal government. Before becoming chief of the Marine Police, Rick served 28 years in the Newport News Police Department, rising in rank from Patrol Officer to Captain. He grew up in Newport News and earned a Bachelor's degree from St. Leo University. Rick's hobbies include hunting and fishing. He is an accomplished saltwater angler with many trophy citations to his credit.